Fresh vegetables are starting to roll into local farmers markets, and what better way to whet summer appetites than by firing up the Weber for a quick and easy appetizer? You know you want to be outside after sitting behind a desk all day, and carbs on the grill are so much easier than you might think. All you need to make the primo Italian dish bruschetta (pronounced broo-SKE-tah) is a loaf of crusty bread, some olive oil, a clove or two of garlic and a couple great toppings. That, and a sharp knife to cut the bread on the bias into thick, grillable slices and a pair of tongs so you don’t singe your fingertips when you’re crisping it to perfection on the hot grates. I’d go so far as to argue bruschetta is the backyard griller’s dream, because it looks and tastes absolutely amazing with so little work. 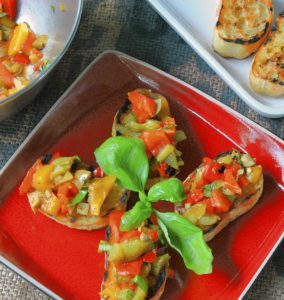 In its purest form, making bruschetta can be as simple as toasting a piece of bread on the grill or over a fire’s embers, rubbing it with a cut clove of garlic and then drizzling on top a fruity extra-virgin olive oil and sprinkling it with salt. For a more substantial dish, thoughts immediately go to traditional diced tomato-based toppings. But why stop there? Consider each slice of toasted bread as a crisp blank canvas, just waiting to be painted to life with an artist’s palate of different colors, textures and flavors. Savory, sweet, tangy, spicy — bruschetta lends itself to any number of ingredients and combinations. Everything from roasted peppers, mushrooms and eggplantto salty anchovies, delicate cheeses and fruit. Yes, fruit. You even can serve bruschetta for dessert, as the recipe below for Peach and Blue Cheese Bruschetta demonstrates. Any rustic, open-textured bread will work just fine for bruschetta, but keep in mind it should be coarse enough that pools of olive oil can sit on the surface. It also should be sturdy so the toppings, which can be juicy, especially if tomatoes are involved, won’t drip through and end up on your chin or lap. Breadworks’ ciabatta is my favorite, but you can use thick slices of Italian. I’ve had great successes with sourdough and Frenchbaguettes, too. And if it rains? Simply brown up the bread under the broiler, toast it in a hot oven or do like I do in winter and fry it on the stove in a little olive oil. Magnifico! Below, we offer a few favorite recipes to help you savor the season. My favorite way to eat tomatoes in summer. If you’re feeling adventurous, add a generous pinch of hot red pepper flakes. Combine chopped tomatoes, garlic, basil and parsley. Add a dash or 2 of balsamic vinegar and a few teaspoons of olive oil. Season with salt and pepper. Let it sit for a while so the flavors combine. Grill bread on both sides until slightly charred, about 30 seconds per side. Remove from grill, drizzle with olive oil and season with salt and pepper. Top each half with the tomato mixture. Sprinkle a generous amount of parmesan cheese on top. Slice crosswise into 1-inch-thick slices, and serve. This dish has both sweet and sour notes. It’s best to make the topping at least an hour before, so the flavors can meld. I left out the raisins and celery because my kids don’t like either cooked. You can find ricotta salata, a Sicilian goat cheese that’s similar in texture to Greek feta, at Pennsylvania Macaroni in the Strip District. Or simply substitute regular feta or another tangy, crumbly cheese. Heat your grill to high for direct grilling. Brush eggplant and tomatoes with 1/4 cup of canola oil and season with salt and pepper. Grill eggplant until golden brown and cooked through, about 4 minutes per side. Grill tomatoes until charred all over, about 8 minutes. Remove both to a cutting board and dice. Grill bread on both sides until slightly charred, about 30 seconds per side. Remove from grill, drizzle with olive oil and season with salt and pepper. Top each half with some of the eggplant caponata and sprinkle with ricotta salata. Slice crosswise into 1-inch-thick slices to serve. The original recipe calls for sweet brioche, but you certainly can use Italian or French bread. You can make the topping up to three days in advance, but be sure to bring it to room temperature before spooning it onto toasted bread. To make garlic oil, mash 1/2 clove of roasted garlic and mix with 1/2 cup olive oil and juice of 1 small lime. In a medium bowl, combine peppers, olives, garlic oil and basil. Mix well to form a spread. Evenly divide topping and spread it on the toasted brioche. Cut the bread in half on the diagonal, arrange on a dish and serve. Easy, and just a bit salty. Slice tomatoes in half. Combine them with garlic, anchovies with reserved oil, and a pinch of salt in a plastic bowl with a tight-fitting lid. Cover bowl and shake vigorously. Spoon tomato mixture over freshly grilled bread and serve immediately. Looking to hit your sweet spot? This recipe pairs fragrant grilled peaches with crumbly blue cheese and a drizzle of honey. If you can’t find good, fresh peaches, substitute nectarines or apricots. Prepare grill for direct cooking over medium-low heat (about 350 degrees). Stir cream cheese, sugar and thyme until blended. Set aside. Lightly brush peach halves and bread slices on both sides with oil. Grill the peach halves over direct medium-low heat, with the lid closed, until lightly charred and beginning to soften, about 8 minutes, turning once. 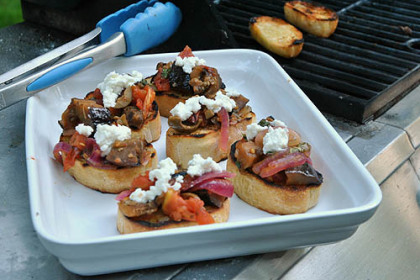 During the last minute of grilling time, toast the bread slices over direct heat, turning once or twice. Remove peaches and bread from grill. Spread each bread slice with an equal amount of cream cheese mixture. Cut peach halves into 1/2-inch slices. Divide peach slices among the bread slices, overlapping them slightly. Top with blue cheese and drizzle with honey. Serve right away.